One of our writers from TypesofBacteria interviewed Hari, an aid worker in India who is working with communities where leprosy is still a major health problem. 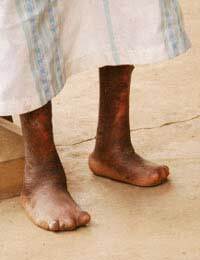 Leprosy, an ancient disease, is caused by the bacterium Mycobacterium leprae. It affects many people in India who are often afraid to seek treatment because of the stigma that still surrounds the disease. TypesofBacteria: How many people in India have leprosy now? Hari: “That’s quite a difficult question to answer because it is difficult to get any accurate figures. The World Health Organisation has set a target for the official elimination of leprosy in any particular country. This target is less than one new cases per every 100 000 people per year. At one point, India seemed to have got down to about 2 cases per 100 000 people and since then, there has been a great effort to get those figures down by ‘massaging’ the figures rather than actually helping people. TypesofBacteria: How are the figures being manipulated? Hari: “When the health authorities were trying very hard to reduce the number of people with leprosy, health workers were being asked to actively search out new cases. They were examining people to see if they had the disease, even though they themselves might not be admitting it. More recently, health workers have been encouraged to turn a blind eye and to record as few new cases as possible. This does not mean that leprosy cases are reducing – it’s just that fewer are being officially recorded. TypesofBacteria: Why would people not admit to having leprosy? Hari: “Leprosy has been a source of intense stigma for centuries. In the past, special colonies were set up where people with leprosy had to live and they were not allowed to mix with people in the rest of the community. They had to wear bells and special clothing to mark them out so that people could avoid them. Part of the reason is that leprosy is contagious – but so are a lot of other diseases that do not create this kind of stigma. I think it is also because leprosy causes disfigurement and disability and has for hundreds of years been regarded as a curse. Today, much has been done to educate people in India about leprosy and show them that modern medicine can now treat it very successfully, but the old stigma persists and people with leprosy are very often afraid to admit it, even to themselves. TypesofBacteria: How do you treat people with leprosy? Hari: If someone with leprosy is diagnosed at a very early stage, before the bacterium that causes leprosy has had a chance to damage some of the nerves in their skin, it can be treated very well with a six month course of antibiotics. Three different ones are used at the same time and it is important to finish the treatment. If there is a delay and some nerve damage has already taken place, the antibiotic treatment will get rid of the bacteria, but nothing can be done to help the nerves. This damage is permanent. As it is often in the hands and feet, it is important to teach people how to manage their own care. I show people how to examine their hands and feet every day to make sure they have not cut themselves, don’t have a wound or infection, or any other skin damage. Self-care can help them maintain a good life; without it they are likely to lose fingers or a whole hand and become unable to look after their family. TypesofBacteria: How do you persuade people that they should not be ashamed of leprosy? Hari: It is very difficult. Changing attitudes that have been present for so long is hard. International organisations and events such as World Leprosy Day, which is at the end of January every year, are important because they help raise awareness of the disease. This is crucial in communities where leprosy is still present, but it is also very helpful in nearby regions where leprosy is no longer a problem. TypesofBacteria: If the stigma was not there, could leprosy be eradicated? Hari: Dealing with the fear that surrounds leprosy would be a big step towards people seeking earlier treatment that would then show others that cure was possible. Success would build on success. It would also mean that the close relatives/household or someone with newly diagnosed leprosy could be given a shorter course of antibiotics. This is a new strategy that has been shown to reduce the transmission of leprosy. If this happened more often, leprosy cases would really fall and we might someday be free of this disease.